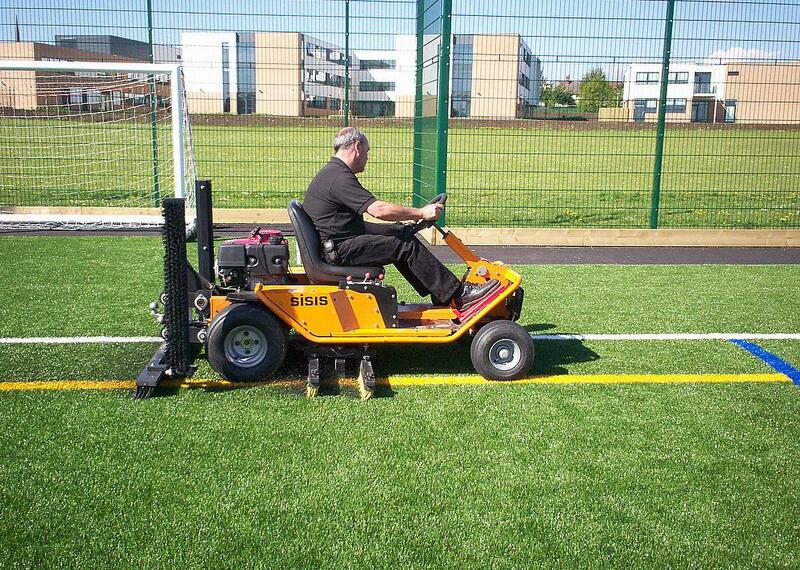 Andy Walker, Field Support Manager for Dennis and SISIS, demonstrates the SISIS Brush-Pro at one of the synthetic sports pitches that White Horse Contractors (Northern) maintain. White Horse Contractors offers a total turn-key solution for anyone looking to construct or refurbish their synthetic turf sports facility. They are also actively involved in the on-going maintenance after hand-over and it is something that Contracts Director Jim Crabbe sees growing to a wider client base. Jim says that he extensively researched the market when he was looking for a new machine that would give a good, groomed finish and was easy to transport from site to site. The Brush-Pro ride-on system consists of a pair of mid-mounted oscillating brush units and three foldable rear mounted brushes spreading 3 metres for more regular maintenance, which means fewer passes are needed compared to more conventional drag brushing, causing less compaction. “The brushes are integral to the power unit, fold up for easy transportation from site to site and then spread to 3 metres. This machine provides a quality finish with the oscillating brushes cleaning the top layers of rubber infill whilst ensuring an even distribution across the surface and helping the carpet fibres stand up which keep the pitches looking great." The SISIS Brush-Pro has been designed for maximum manoeuvrability and operator comfort which features an electric start, hydrostatic drive for forward/reverse and its brush combinations - oscillating for thorough periodic work and rear mounted brushes for more routine work. The unit is powered by a powerful Honda GXV390 engine and includes a tow hitch suitable for use with the SSS1000, a one metre wide sweeper and rotary brush for use on synthetic turf surfaces to remove debris. “The SSS1000 sweeper attachment is simple and easy to use that does the job. Both products are robust with staff quickly becoming familiar with them. The Brush-Pro provides a quality finish, allows us to quickly and easily keep an even rubber distribution on pitches whilst the SSS1000 sweeper removes litter, leaves, etc. efficiently and fast,” said Jim.